An important step in the conservation planning process is identifying existing protected lands and evaluating the contribution of those lands to biodiversity values based on the level of stewardship provided by the managing entity. This is a key dataset in the development of the Conservation Land Network because Marxan, the site selection software, is directed to build upon already conserved lands. 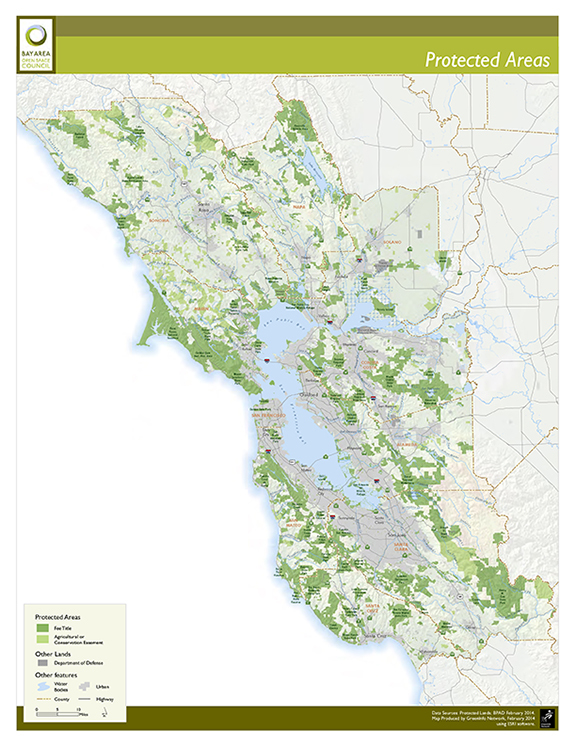 The Bay Area Open Space Council has collaborated with GreenInfo Network over the past 13 years to develop a very detailed GIS database of protected areas in the 9 county San Francisco Bay Area (see map above), adding Santa Cruz County in 2010. The Bay Area Protected Areas Database (BPAD) includes open space that is owned in fee or easement by a public agency or a private, nonprofit land trust and is held primarily for open space purposes. The second task of evaluating the stewardship of protected lands and thus the contribution to biodiversity conservation is a complicated one and was not completed for the project. In lieu of a stewardship analysis, the project team modified the BPAD prior to the analysis by removing protected lands that could be readily identified as having little or no contribution to biodiversity such as cemeteries and golf courses. Additionally, the BPAD includes lands with easements protecting cultivated agriculture. These lands provide foraging areas for some species such as raptors and waterfowl, but have been converted from the natural cover and are not appropriate for inclusion in the CLN. Department of Conservation Farmland Mapping and Monitoring Program data were used to identify cultivated agricultural lands, including those with easements, and these areas were assigned very low conservation suitability scores to reduce the probability of their selection by Marxan, the site selection software. Download this database for FREE here.